I used to live in FL. Love reptiles and animals- have 2 dogs, 2 Leopard Geckos, and a bunny and used to have hermit crabs. Hoping to become exotic vet so I can give medical attention to pets that get very little. I do full research on any species before I purchase it as a pet. 08:18 AM - TheSmiths quoted Curlydragonfruit in post What Morph is this? Pretty easy determination on these two love birds! 08:09 PM - Curlydragonfruit quoted cricket4u in post Lost Baby Leopard Gecko!!!!! !HELP PLEASE!!!! 04:32 PM - Elizabeth Freer quoted Curlydragonfruit in post Lost Baby Leopard Gecko!!!!! !HELP PLEASE!!!! 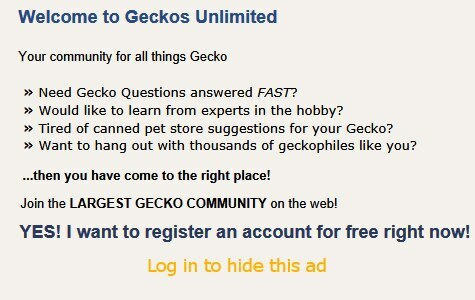 03:57 PM - cricket4u quoted Curlydragonfruit in post Lost Baby Leopard Gecko!!!!! !HELP PLEASE!!!! 01:43 AM - Elizabeth Freer quoted Curlydragonfruit in post Lost Baby Leopard Gecko!!!!! !HELP PLEASE!!!! 12:49 AM - Curlydragonfruit quoted acpart in post Lost Baby Leopard Gecko!!!!! !HELP PLEASE!!!! 11:19 PM - Curlydragonfruit quoted lbanta in post Pesticides + Geckos = ????? 11:15 PM - Curlydragonfruit quoted Aimless in post Pesticides + Geckos = ???? ?